Starting this weekend, we have a jam-packed schedule of activities in store over half term for children to enjoy and get involved in at the Maltings! We have three exciting, new theatre shows lined up; the wonderfully wacky Albee Vector: Sound Collector, and cuddly fun to be had with the Teddy Bear’s Picnic. You can also expect a one of a kind, ghoulish Sleeping Beauty dance workshop with Re:Bourne & the Dance Movement, the BFG on the big screen, and a selection of spooky craft workshops that include creating special effects monster makeup! You definitely won’t want to miss out! Help Dot, Smidge, Mooch and Nora save their beloved clocktower – in the nick of time! Cloud Cuckoo Land put children right at the heart of the story in this new play, full of interactive musical fun, sensory storytelling and movement games. A cast of actor-musicians create a unique 360° immersive listening experience by playing a wide variety of instruments live, all around the audience. An interactive tale of love, adventure and a sound-hoover called Mustard! Sounds are running low and so Albee Vector will need a few more noises to tell this particular story… Can you help him? He’ll need you to make popping, fizzing, hissing, clopping, whizzing, whooshing, banging, crashing, and probably a fart noise or two! Come along and find out how Albee and his love Andromeda survived kings, curses and cruelty on their quest for beautiful sound in the world. The Dance Movement are working alongside New Adventures and Re:Bourne to bring Farnham’s children a spectacular Halloween treat to remember! Join professional dancers from Matthew Bourne’s own dance company, and try out ‘vampire style’ choreography to recreate a spooky, Sleeping Beauty themed masterpiece! The BFG, based on Roald Dahl’s classic tale, follows the enquisitive Sophie as she comes face to face with the Big Friendly Giant! Despite his intimidating appearance, the BFG turns out to be a cheery and kind-hearted soul, who is considered an outcast by the other giants (because he refuses to eat children!) Join Sophie as she discovers a world of giants, friendship, and a very important mission! Bring your favourite teddy and bags of enthusiasm to see if you can help solve the mystery of the missing invitation. Featuring live music, puppetry and lots of bright colours! To round of Farnham Craft Month, we have a week worth of great halloween inspired workshops for kids working with some of our Maltings resident artists and makers. 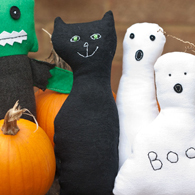 Have fun learning sewing stitches with local authors of children’s sewing book ‘Sewing for kids’, Alice Butcher and Ginny Farquhar whilst creating your own hand stitched fabric Halloween spooky softie. Fun for all young photographers! Take spooky photos with a Halloween theme while resident photographer Angela Walker explains your camera buttons and menus and gives top tips for taking better pictures. 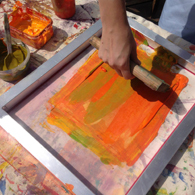 Learn how to screen print with Nicole, she will guide you through each stage of the printing process. All materials included in the workshop, but please see what you have at home to upcycle and print onto! Make fun photograms with a Halloween theme, using objects and shapes to create real photos without a camera. 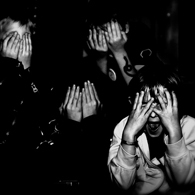 Watch magic as your photos appear in the Maltings darkroom, with help from resident photographer Angela Walker. In this Monster makeover workshop you will be working with professional products to create realistic wounds, bruises and zombie like makeup. You’ll learn a range of techniques and walk away looking like Halloween has come early! Come along and have fun decorating spooky cupcakes all ready for Halloween. Make creepy decorations for your cakes, then ice them and take them home with you to give to your friends and family. All cakes and materials supplied at the workshop. This entry was posted by Niki Hanmer on Monday, October 17th, 2016 @ 4:34pm and is filed under News. You can skip to the end and leave a response. Pinging is currently not allowed.